This will be out of context for most of you. Sorry. Simon and I have been “conversating” on the topic of digital writing, and making writing as we have been going along. This morning/last night, Simon posted a poem inspired by a documentary of writer William Gibson shared by Terry that I referenced in a collaborative conversation document that Simon and I are engaged in. I listened and read Simon’s post and then decided that I wanted to wrangle it into new shape. 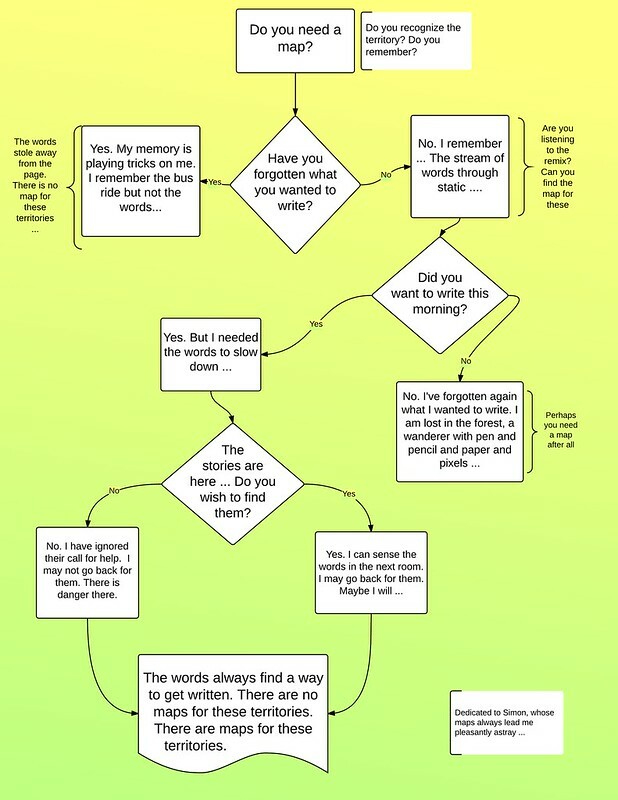 I wanted to create a flow chart/decision tree that captured the essence of Simon’s ideas and also revisited the idea of: Do we really need a map? Are these uncharted territories? How is writing a shifting landscape? Simon and I were chatting about the idea of uncharting the territory. I think of your flowchart as an ultra thin, representative slice of the territory. We know very well that it is just crumb from the sensuous experience of the pie. Notice that I had to move from the map metaphor to the pie metaphor. I guess that’s because of the word ‘slice’. The flowchart does capture something in a static (I don’t mean that pejoratively because I love your chart(s)) way whereas a slice of pie is full of taste and smell and tongue touch and whole sensorium Long live pie. Maybe what I need is a pie chart? Note the annotations on the soundcloud. Tried to get into the spirit. Also, note that the anti-spam captcha for today is “slain aid”. I like this idea of annotating territory – I like this idea of territory, landmarks, placing markers, graffiti, tatoos. The annotations bring an entirely new level to the reading/listening to the piece. Very powerful. We don’t need a map. We need to map.